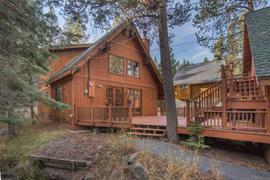 Currently there are 33 properties for sale in Tahoe Donner. Properties range in asking price from $149000.00 - $1600000.00 with an average asking price of $868045 and a median asking price of $849000.00. Price per square foot ranges from $47.57/Sq Ft - 735.63/Sq Ft. On average these 33 properties have been on the market for 107.15 days. 14 of these properties have reduced their asking price with the average reduction being $14564. 0 of the properties are distressed sales (either REO bank owned or Short Sale). 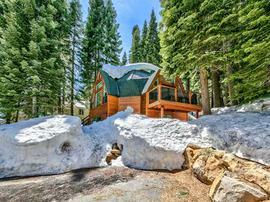 In the past 180 days, 135 properties have sold in Tahoe Donner. 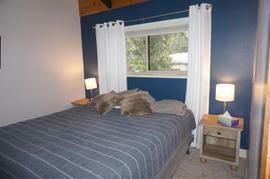 Sales prices during this time period ranged from $110000.00 - $1850000.00. On average these properties were on the market for 83.44 days and final sales prices were on average 98.17% of the original listing price. 40.74% of the sales were reported as cash sales. 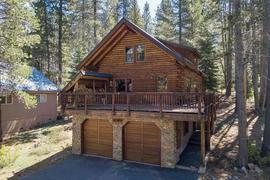 Tahoe Donner is located in Truckee California and consists of roughly 6,500 properties. 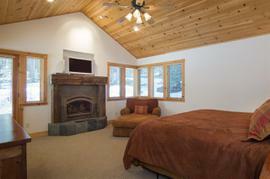 The homeowners association offers exceptional recreational amenities for home owners at a very reasonable cost. 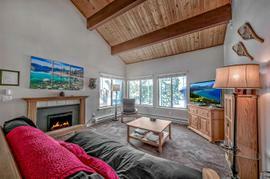 With a variety of price points and a relatively consistent inventory of homes for sale, families often choose Tahoe Donner for their vacation home. 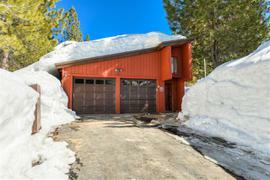 Amenities for the Tahoe Donner home owner. Located on the east end of Donner Lake, The beach Club Marina is a private spot for Tahoe Donner homeowners and their guests. The Marina Grill offers lunch just steps from the beach. Activities offered at the beach include lesson and rentals for standup paddleboarding, windsurfing, kayaking, and sailing. The marina also has their own boat launch and is staffed by people dedicated to directing traffic. Tahoe Donner’s Adventure Center is located at the northeastern edge of the subdivision and servers as the Cross Country Ski Area facility during the winter and the base for Bikeworks, Day Camps, and the Equestrian Center during the summer. With over 60 miles of trails, Tahoe Donner property owners can spend time exploring nature and return to the Adventure Center for a meal at the Alder Creek Cafe or drinks at the Trailside bar. The cafe offers breakfast, lunch, and an apres menu in the evening. Bikeworks in the Alder Creek Adventure Center offers guided trips, a bike camp for kids, and rentals for everyone in the family. Rental options include; trailers for the youngest, fat bikes, comfort cruisers, road bikes, and full-suspension mountain bikes. Tahoe Donner offers a lot of options for kids camps. One of our favorite is the FUN DAYZ Camp. Friends Uniting in Nature (FUN) focuses on outdoor exploration and environmental awareness. From hiking and mountain biking to archery and tennis, the staff is awesome and the kids have a great time. 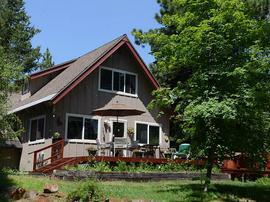 The Equestrian Center is also located at the Alder Creek Adventure Center. Experienced guides and their seasoned horses offer guided rides, lessons, a kids horsemanship camp, and even pony rides for youngest in your family. From the lush Eur Valley and it’s wildflowers and streams to the mountain meadows, a guided trip makes for a great family experience. A championship course offering 18 holes, 7,002 yard par 72. The course sits in the center of the community and features awesome views, beautiful creeks, and stunning granite formations. The Winter Golf Academy offers homeowners the chance to work on their game through a virtual golf experience. The TruGolf simulator features a launch monitor and world class courses displayed on their 142” high definition screen. Located in the meadow of Bennett Flat, the tennis center offers 11 courts, 2 practice walls, and 2 pickleball courts. The center offers lessons, events, and junior and adult clinics. The recreation center is located next to the golf course and offers a year round heated outdoor lap pool, a recreational pool, weight and cardia rooms, steam room, dry sauna, massage rooms, personal training, fitness classes, and a kids club. The trout Creek Recreation Center is a state-of-the-art facility with excellent instructors and trainers. Tahoe Donner homeowners can enjoy over 60 miles covering nearly 3,500 acres of beautiful terrain. The trail department collaborates with biologists, engineers, and watershed agencies to ensure the trail system not only meets the needs of the homeowners but also meets the highest level of environmental compliance. A great spot to bring the family for snow play. Families can enjoy monitored tubing lanes, sled rentals, snow bowling competitions, and the food truck TD Eats servers hot food and drinks on Saturdays and Sundays. The Lodge Restaurant and Pub offers a quiet spot next to the fireplace or a great spot to watch the game at the Pub. Floor to ceiling windows and an award winning French and Pacific-Rim bistro style menu featuring locally grown produce and organic meats. The Lodge is a great spot for a wedding or your special event. The Alder Creek Cafe is located in the Adventure Center. Also featuring locally sourced and organic, a new menu is offered each season and often features gluten-free choices. Site and relax or take your food on your adventure. The Trailside Bar offers unique draft and bottled beers and a wine list with many eco-friendly options. Pizza on the Hill is located next to the Northwoods Clubhouse and Tennis Center. The menu offers pizza, pasta, sandwiches, salad bar, and appetizers. Sit outside next to the play structure or watch the game inside. Pizza on the Hill also boasts a interactive playroom with foosball, hockey dome, shuffleboard, and dart lanes. Special events include free movie nights, bingo and trivia nights, and special events. 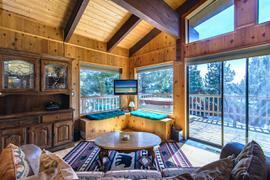 In the clubhouse you will find Pizza on the Hill and the Tahoe Donner Homeowners administration offices. The Northwoods Pool is a great spot for young kids featuring the tube slide and the play structure.